Like a wafer, the Wynn Casino and Hotel in Las Vegas, aka Sin City or LV, stands illuminated along the famous Strip. 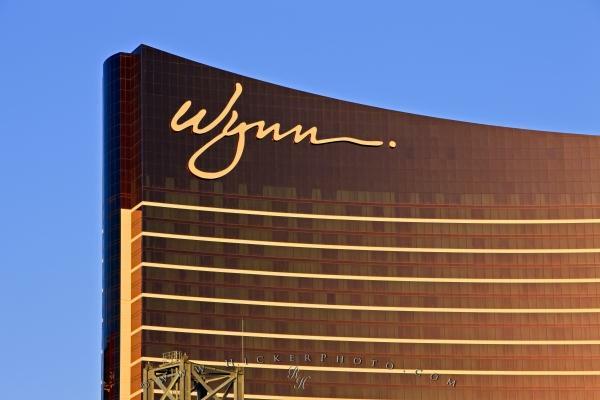 Bronze with yellow lights, the wafer thin Wynn Casino and Hotel in LV, stands out as night takes hold in Sin City. Situated along the famous Las Vegas Strip, The Wynn resort covers an area of 215 acres and features an 18 hole golf course. Wynn Casino and Hotel, Las Vegas Strip, Las Vegas, Nevada, USA. Photo of the illuminated facade of Wynn Casino and Hotel, LV, Nevada, USA at dusk.